When giving athletes extrinsic feedback about their technical skills, you can either tell them what you saw (descriptive feedback) or tell them what you think they need to do based on what you saw (prescriptive feedback). It has been said that “experience is knowledge acquired too late.” As a coach you want to do all you can to speed up your athletes’ learning of tactical skills rather than wait for them to learn by experience. Sport Skill Instruction for Coaches is designed to help current and aspiring coaches teach the skills athletes need in order to perform at their best. Written from a real-world perspective primarily for high school coaches, this practical, user-friendly text addresses the who, what, and how questions facing every coach: Who are the athletes I’m coaching? What are the skills I need to teach? How do I teach the skills effectively? 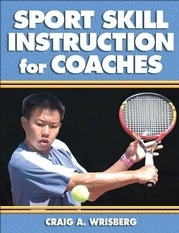 Coaches will address these questions by thoroughly examining such concepts as individual differences exhibited by athletes; technical, tactical, and mental skills athletes need to learn; content and structure of skill practice; the art of providing feedback; and the preparation of athletes for competition. This exploration prepares coaches to work with athletes competently and confidently. The easy-to-follow format of the text includes learning objectives that introduce each chapter, sidebars illustrating sport-specific applications of key concepts and principles, chapter summaries organized by content and sequence, key terms, chapter review questions, activities that challenge readers to apply concepts to real-world situations, and a comprehensive glossary. High school coaches; also for college undergraduates pursuing professions as coaches, physical education teachers, and sport fitness practitioners. Craig A. Wrisberg, PhD, is a professor of sport psychology in the department of exercise, sport, and leisure studies at the University of Tennessee at Knoxville, where he has taught since 1977. During the past 30 years he has published numerous research articles on the topics of anticipation and timing in performance, knowledge of results and motor learning, and the role of cognitive strategies in sport performance. He is also the coauthor (with Richard Schmidt) of the popular text Motor Learning and Performance, published by Human Kinetics. In 1982 he received the Brady Award for Excellence in Teaching and in 1994 the Chancellor's Award for Research and Creative Achievement. A former president of the Association for Applied Sport Psychology (AASP) and the North American Society for the Psychology of Sport and Physical Activity, Dr. Wrisberg is a fellow of both AASP and the American Academy of Kinesiology and Physical Education. In addition to teaching and conducting research, Dr. Wrisberg provides mental training services for student-athletes in the men's and women's athletics departments at Tennessee. In his work with athletes, he applies many of the important concepts and principles covered in Sport Skill Instruction for Coaches. Dr. Wrisberg enjoys several outdoor activities, including tennis, canoeing, and hiking in the Great Smoky Mountains.